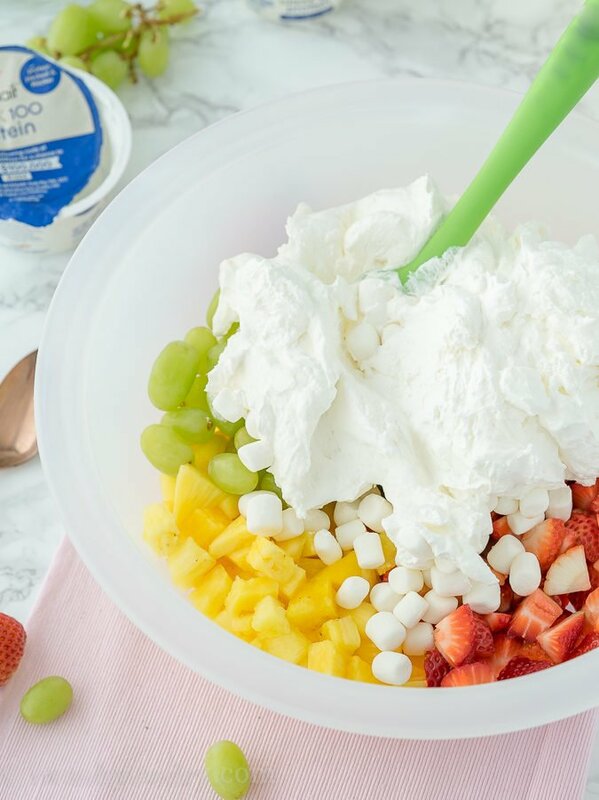 Nothing screams “SPRING!” more than a big bowl of this Ambrosia Fresh Fruit Salad! 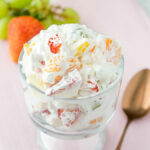 Ambrosia Fresh Fruit Salad is a delightful blend of fresh fruits and mini marshmallows in a light and fluffy dressing. 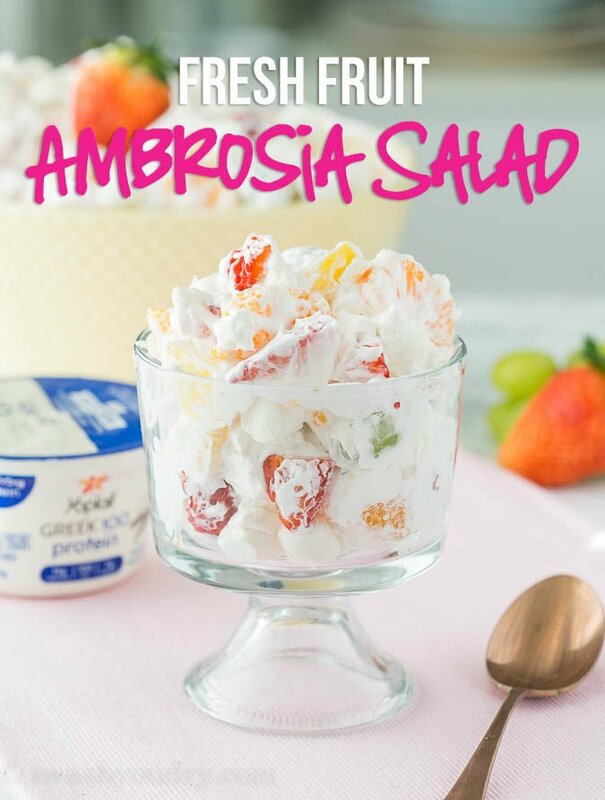 If you’ve never experienced an Ambrosia salad before, than you’ve definitely been missing out! 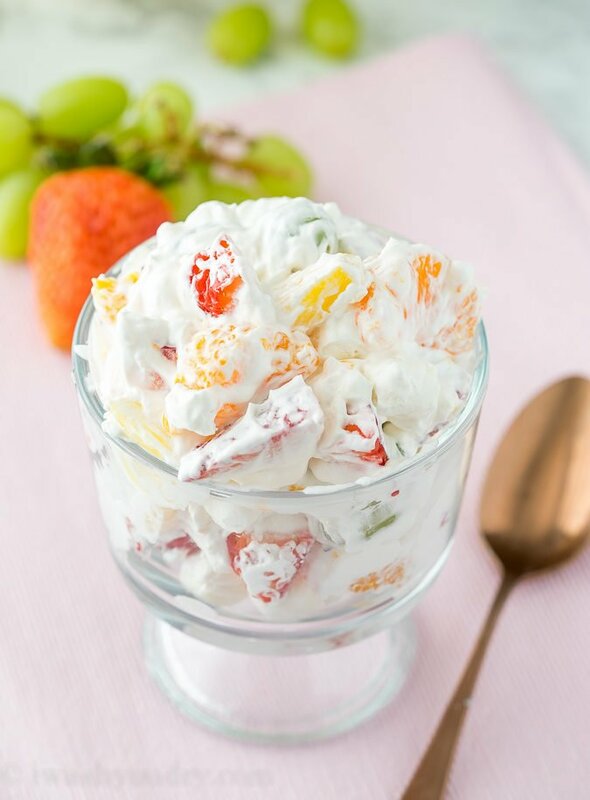 Ambrosia is usually a mixture of canned fruits mixed up in a whipped topping. Sometimes you’ll find nuts and/or shredded coconut in there as well. I wanted to keep things light and fresh with my recipe, so I used loads of fresh strawberries, pineapple and grapes. I also mixed in those tasty mandarin oranges and a handful of mini marshmallows, because I just love how they add sweetness and a delightfully fluffy texture! 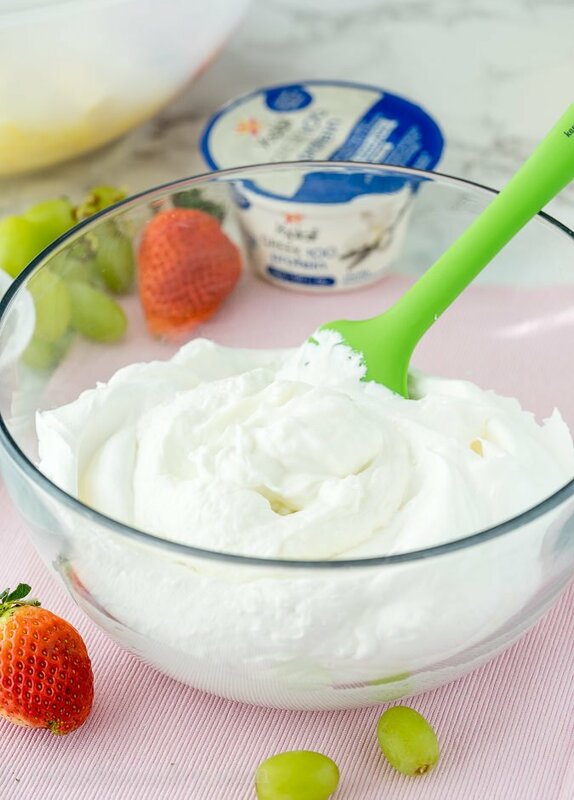 When it comes to the creamy topping that everything is mixed up in, I started out with a cup of Yoplait Greek 100 Protein vanilla yogurt. 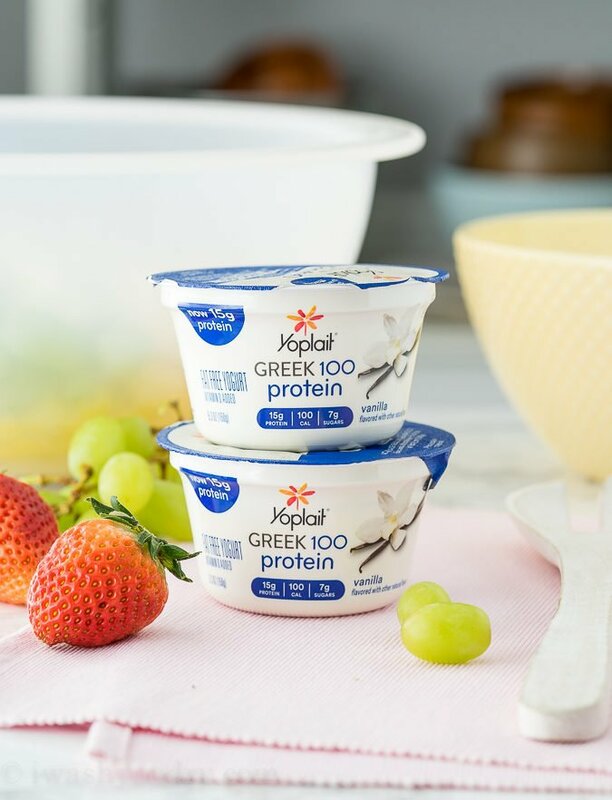 The newly updated Yoplait Greek 100 Protein yogurts come packed with 14 to 15 grams of protein per serving and are still 100 calories! Now that’s a snack I can definitely get behind! The creamy texture and tangy vanilla taste of the Yoplait yogurt mixed with the whipped topping is a match made in heaven! If you wanted to switch up the flavors of yogurt you could totally do that too! Speaking of coconut, I left out the shredded coconut that’s a typical addition to an Ambrosia salad because I wanted to let the fruits shine. If you’re a die-hard coconut fan you can definitely toss in some sweetened shredded coconut (I’ll leave measurements in the notes section of the recipe below)! I made this Ambrosia Fresh Fruit Salad to take to a family gathering and it was the first thing to go! Everyone completely loved it and licked their plates clean! substitute raspberries for the strawberries for a fun twist! 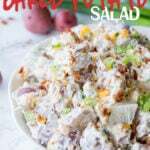 Luckily it only takes a few minutes to whip this delicious salad up! 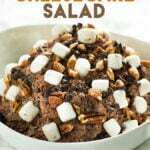 Start your Spring off right with a big bowl of this delicious salad. 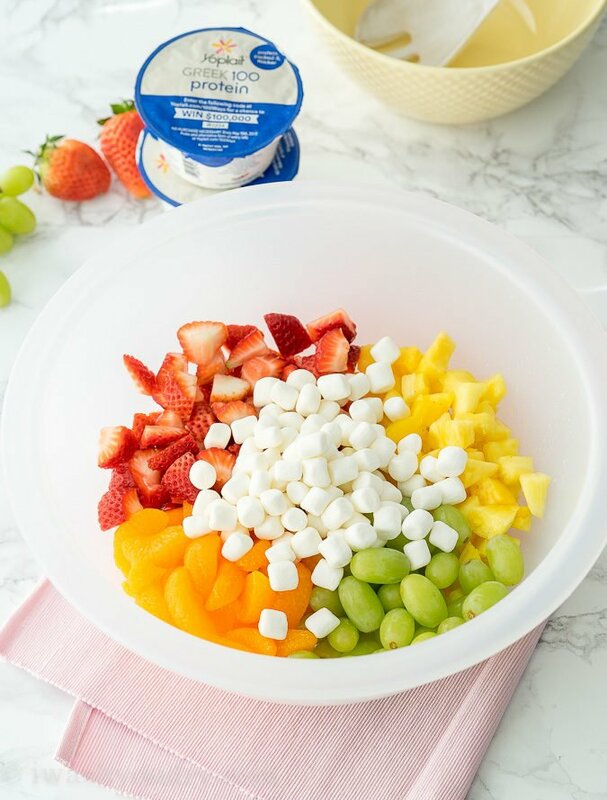 Combine the strawberries, pineapple, grapes, mandarin oranges and mini marshmallows in a large bowl and toss to combine. In a separate bowl combine the vanilla yogurt and thawed whipped topping until smooth. Pour mixture into bowl with fruit and toss to combine. Enjoy within 24 hours. 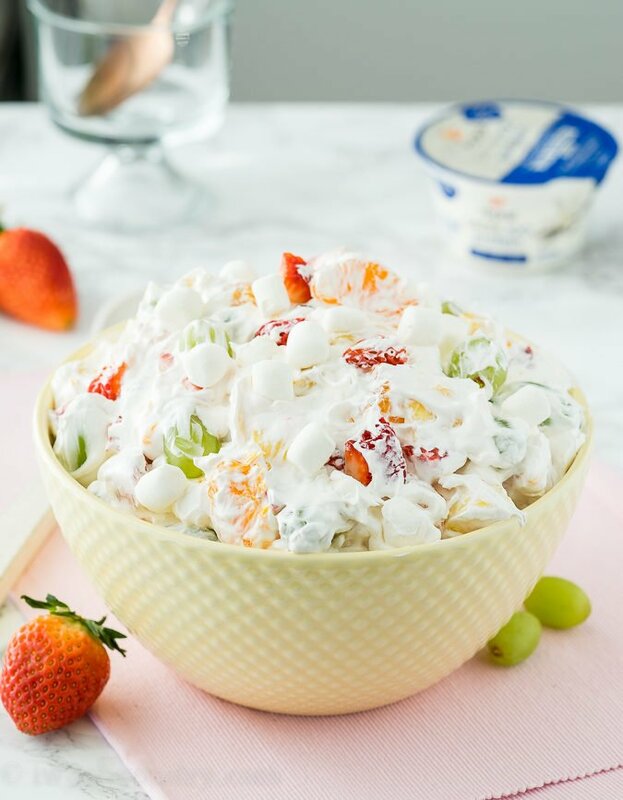 If you want to prep this salad ahead of time (longer than 24 hours), simply combine the fruits in one bowl and wait until serving to toss with the whipped topping. disclaimer: This post is in partnership with Yoplait. 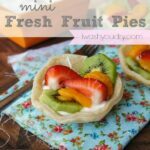 You can find more delicious recipes using Yoplait HERE. All thoughts and opinions are 100% my own. This is a great recipe. My family absolutely love it. 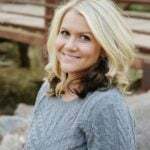 Thanks for sharing this information with us. What can I substitute for pineapple as I am deathly allergic to it. I would already substitute raspberries for strawberries for same problem? 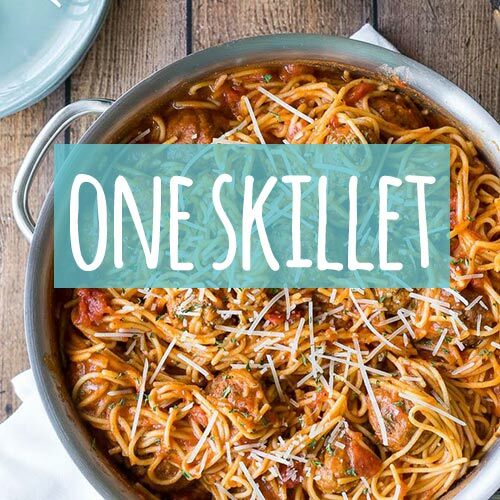 This recipe is amazing, my family and friends loved it. Morning starts with fruit salad always gives me extra energy to work hard. So thanks for sharing this recipe. delicious and healthy. I will add it in my diet. Awesome, this fresh fruit salad looks like cream, it is delicious. Thanks for sharing the detailed recipe. You have to make sure to let this set for at least 6 hours, to let the flavours soak into the marshmallows. This is not a make-and-eat salad. I prefer to refrigerate mine overnight before serving. Oh, I like that idea too! I’ve always just enjoyed it right away, but I’m sure it would taste great after it sets for a while too! Using yogurt can sometimes make it runny, so if you want a more of a sour cream texture. Line a sieve with coffee filter, place in a bowl and let the yogurt drain overnight. This will firm up the yogurt without changing the taste. This is a delicious recipe. 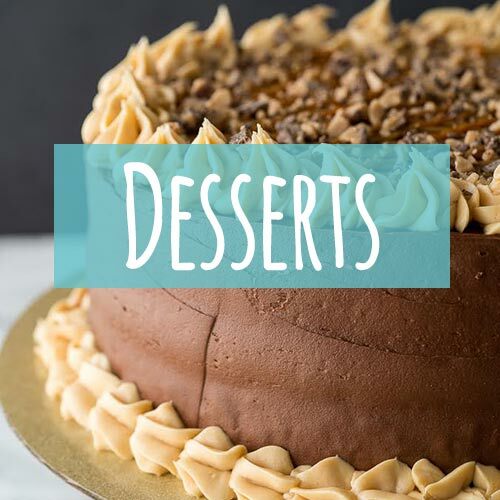 One question this is served as dessert or as first plate. Your choice I’d say , or on a lettuce leaf as salad. Pit would be a good bridal shower dish.